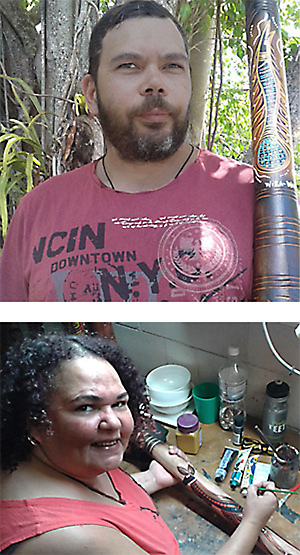 Trevor and Olivia Peckham are a husband and wife team from Far North Queensland who have been making and decorating genuine indigenous crafted quality didgeridoos for over 10 years. Trevor was born and raised in Mareeba by his grandfather, a traditional owner and elder of the Wiradjuri tribal group. This is where Trevor learnt his didgeridoo crafting and unique carving style that is now his signature on all his didgeridoos. 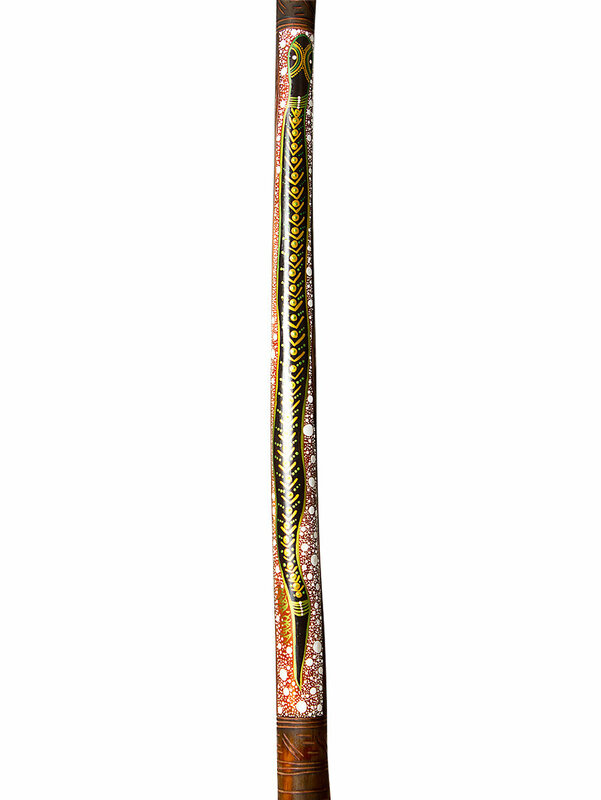 His wife Olivia paints the didgeridoos. She was born and raised in Cherbourg, an Aboriginal community 3 hours north of Brisbane, having moved to North Queensland with her mother and 3 sisters over 20 years ago. Coming from a large family of artists she was encouraged to paint from an early age and has developed her own distinct style using vibrant contemporary colours. 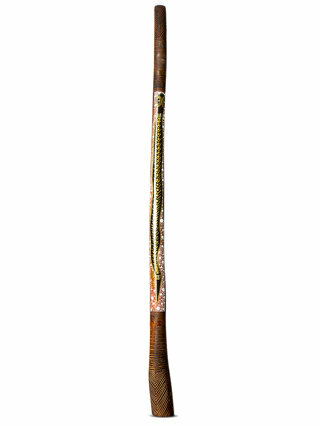 This didgeridoo is made from a native Australian Eucalyptus tree that has been hollowed by a termite and then worked on by the maker to turn it into an instrument. Once cut, the tree or sapling has been allowed to dry, to help minimise and prevent the likelihood of cracks and splits later on. The next process involves stripping the bark, taking further timber off and smoothing and preparing the surface. In its final stage it has been hand painted by Olivia Peckham, hand carved by her husband Trevor Peckham and sealed with a gloss finish to protect the artwork, allowing it to be used as both a serious instrument and a piece of art. The mouthpiece is fitted with a pliable beeswax mouthpiece. The beeswax provides the player with a comfortable seal and is also adjustable to different sizes to suit each individual player. 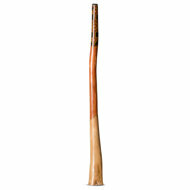 Great affordable genuine Aboriginal made and painted termite hollowed eucalyptus didgeridoo! This didgeridoo will be shipped with DHL or Fedex for only $100AUD to most countries in the world. Fully Insured and delivered in approximately 4-7 days. The tax component will be deducted for international customers at the checkout- so the price will be 10% less than the above price if the goods are leaving Australia. Shipping within Australia will cost $40. Fully insured and delivered between 1-4 days depending on location. Combine shipping and receive further discounts. For example, we can send 2 didgeridoos to most countries for only $150. That 's the price some places charge for one!! Add a painting in the same box for no extra charge!! ANY QUESTIONS - we can be e-mailed at info@spiritgallery.com.au or call us on 61 2 92475961. We are open seven days a week 9.30am -6pm AEST.